It’s going to be warm and cosy for the members and staff at Chrysalis in Wigton this winter thanks to a £16,272 grant from the Cumbria Fund. The charity, which provides support to adults with learning disabilities, has used the grant to upgrade its central heating system. Now complete, it provides a secure future as far as heating the building on Longthwaite Road, is concerned. Prior to this work being carried out, members and staff had been subjected to a number of problems with the old antiquated heating system, including the building being too cold. Polly* has a personal care plan with Chrysalis, part of this includes having a shower with the help of support workers twice a week. Since the project has been completed, Polly has a nice warm wet room to shower in and no longer has to brave the cold. 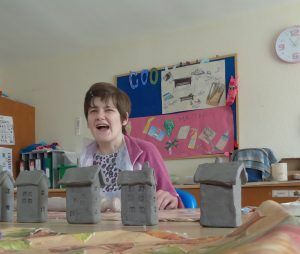 Chrysalis currently supports over 30 individuals each week to access a wide range of both leisure and educational activities through one to one support, group activities and holidays. It also offers an outreach provision which enables its members to access community facilities throughout the day as well as on an evening or weekend. The building provides office space for staff on its upper floor and day support facilities for members including those with more profound physical disabilities on its ground floor.